We’ve all experienced some hoarseness and a crackly voice after attending an exciting concert, sporting event, or while having a cold or laryngitis. Exposure to ammonia, bleach or other irritants in the air can cause some short-lived hoarseness and throat irritation, as well. However, when the problem continues past these events, it can become a serious annoyance and concern that something more than irritation is going on. This can be even more concerning, though, if your livelihood depends on the use and quality of your voice. If you use your voice in a professional setting, you may be more at risk for voice disorders. Unfortunately, professional speakers, singers and others who talk for hours at a time can unknowingly strain and exhaust their vocal cord which, over time, can lead to problems including nodules, polyps, and lesions on the vocal cords. Here at Atlanta Institute for ENT, we provide exceptional, specialized care for professional voice disorders. Common symptoms of voice disorders include not only changes in the sound of your voice like hoarseness or breathiness but shooting pain from ear to ear, “lump-in-the-throat” sensation, neck pain, decreased pitch range. Voice and body fatigue can also be signs that more than laryngitis is affecting the vocal cords. One type of voice disorder is vocal cord paralysis. Vocal cord paralysis occurs when one or both of the vocal cords are unable to move. Transmitting one’s voice naturally becomes difficult when the vocal cords do not function as they were meant to and breathing and swallowing problems can develop with vocal cord paralysis. When only one of the two vocal cords is paralyzed, vibrations are abnormal in the functioning vocal cord because it can’t vibrate against the other. Therefore the individual will not be able to speak very clearly or loudly. Bilateral vocal cord paralysis, on the other hand, occurs when both vocal cords become stuck halfway and can’t move. This may require a tracheotomy to not only restore a person’s voice, but more importantly to protect the airway when a person eats. Vocal cord nodules and polyps cause voice disorders as well. Although benign (not cancerous), vocal nodules are growths that can develop on both vocal cords and are caused by vocal abuse or overuse. With time, vocal cords can wear out and soft, swollen spots develop on each vocal cord. These spots then become harder, callous-like growths called nodules. If the abuse continues, the nodules can become larger and stiffer, thus resulting in hoarseness, breathiness, voice fatigue, and decreased pitch range. 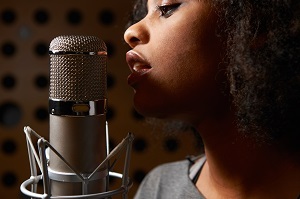 Vocal cord nodules and polyps have been known to end a career for a singer or entertainer. Another voice disorder is something called paradoxical vocal fold movement (PVFM). Paradoxical vocal fold movement disorder occurs when the vocal folds, another word for cords, function normally most of the time, but randomly close when they should open, such as with breathing. Signs and symptoms of PVFM can easily be mistaken for asthma because it causes wheezing and difficulty breathing. If serious, it can also require hospitalization.